Kylie gained her Bachelor of Applied Science (Animal Studies/ Veterinary Technology) from the University of Queensland, Australia in 2007 and has enjoyed a twelve year career as an equine nurse in various equine hospitals including Rossdales & partners (UK), Scone Equine Hospital (Hunter Valley, Australia) and the University of Queensland Equine Hospital (Gatton, Australia). 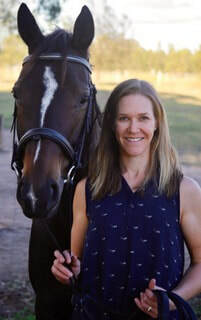 Since having two children, she has partnered her love of horses with her interest in fitness, first becoming a personal trainer and pilates instructor and now an Equipilates Biomechanics Trainer. Kylie has ridden from the age of nine and owns two horses, a Warmblood/Thoroughbred mare, 'Lily', who she currently competes in Novice level Dressage and a retired Australian Stock Horse, 'Regent', who she competed successfully as a teenager. Kylie's aim is to help other riders become the best that they can be by improving their riding fitness and posture, which will in turn promote a harmonious riding partnership with their horse.